Today was shaping up to be a so-so day. Actually, I was feeling a little down. I pressed send on my WIP yesterday and felt a little at a loss today as to what to do. I have four other projects I could get straight into, but I couldn’t settle on any of them, because there’s always that small feeling of loss when you send a book baby out to be judged and hopefully loved by someone else as much as you love it, and it felt a little sad not to be losing myself in the world of the characters I’ve spent so much time with over the last four months. Of course, I immediately took photos and texted them to family and friends and posted on FB and wrote this post – that’s what you do, right, when your first print book arrives in the mail unexpectedly? That and make noises that made the dog run outside! It was an absolute pleasure to work with my fellow Echo Springers on this – Daniel deLorne (Embers and Echoes), TJ Hamilton (Echoes of the Past) and Shannon Curtis (Hope Echoes). You guys rock. Thanks must go to editor extraordinaire, Kate Cuthbert, who came up with this idea and picked me to be a part of it. 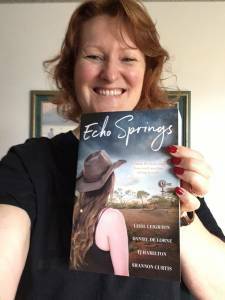 And thanks to the series’ editor who was such a pleasure to work with, Laurie Ormond – I hope I get the chance to work with you again in the future. I have to also say thanks to my agent, Alex Adsett, who brought me this project and was certain I could write to this length even when I wasn’t. 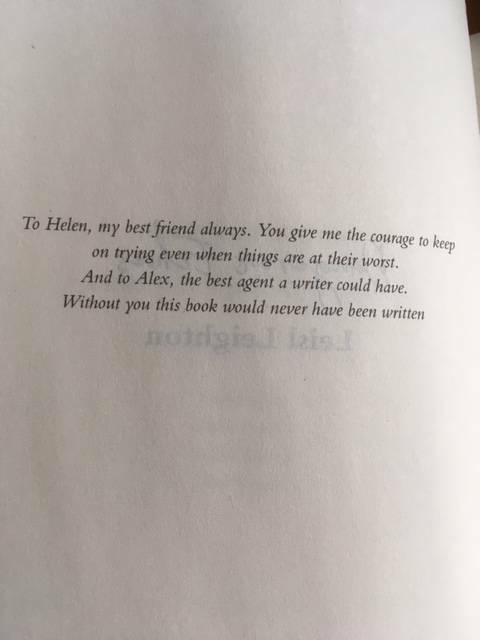 You are the best agent a writer could have. 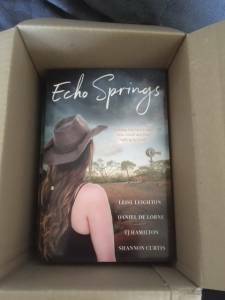 On a serious note, I am particularly happy the print version of my book has arrived this week because I desperately wanted to give a copy of it to my best friend, Helen, who has terminal cancer and has less than a few months to live. 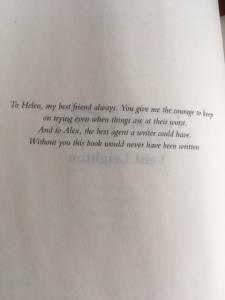 I dedicated this book to her before we found out she was sick, and given what has happened since I wrote that dedication, I was so glad I did because now a little piece of what she means to m e is expressed out in the world for everyone to see. Also, I am going up to Canberra to see her next week with my family so we can all say our goodbyes, and I promised her I would put a copy of my first print book in her hands – and now I can. She has always believed in me so hard and that belief has helped me through some very hard times in the past. I feel like this book is a physical piece of that belief and my love and eternal friendship and gratitude to her that will last long after she is no longer a physical presence in my life. She will most definitely be a spiritual presence – she says she’s going to haunt my arse, but in a Casper the friendly ghost or guardian angel kind of way, not the scary poltergeist kind of way. Although, if I don’t live the life she knows I can, she’ll definitely get scary! But all jokes aside, I know she will continue to be that voice in my ear, that presence at my shoulder, that will push me forward and give me a kick in the pants or a warm hug or a kiss of congratulations when I need it, and now, with this dedication and my ability to put a physical copy in her hands, she will definitely know (not that she doesn’t already) just how much she means to me and how she’s always going to be in my life. This one’s for you, Helen. I love you. 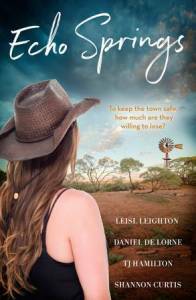 Echo Springs is a 4 book series set in the fictional town of Echo Springs. 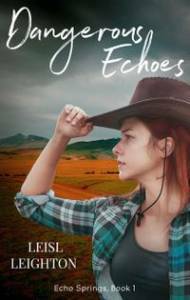 My novel, Dangerous Echoes, is the first book. 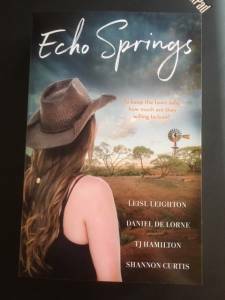 Echo Springs will be out in print in August 20th and you can pick up your copy at all good retailers. Dangerous Echoes will be released as a digital novel on its own in September.